Walking distance to the beach. Staff were very friendly and check in and out very smooth. Breakfast is under satisfactory level. Check out late 30' was charged very high, even you called to notify you were on the way back to the hotel to take the language out. Nhân viên lễ tân tuyệt vời, hiểu ý khách và sắp đặt vị trí phòng tốt nhất cho tôi. Hồ bơi sạch đẹp. Tiện nghi ổn. Gần biển, không gian yên tĩnh, hồ bơi sạch. Không gian sân vườn rộng rãi. Bữa sáng ngon,khu vực hồ bơi đẹp,không gian nghĩ ngơi trong khu yên tĩnh! 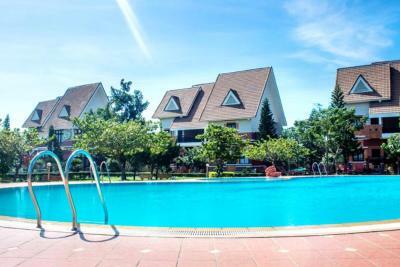 Lotus Vung Tau Resort This rating is a reflection of how the property compares to the industry standard when it comes to price, facilities and services available. It's based on a self-evaluation by the property. Use this rating to help choose your stay! 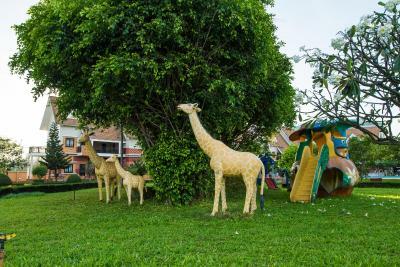 Located in Vung Tau, within 2 miles of Nghinh Phong Cape and 2.3 miles of Christ of Vung Tau, Lotus Vung Tau Resort has accommodations with free WiFi. 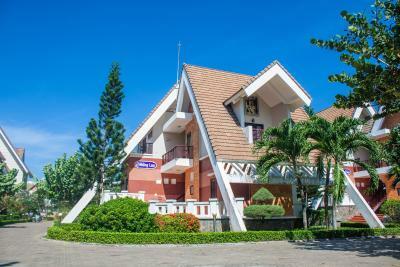 2.9 miles from White Villa, the property is also 4.4 miles away from Vung Tau Lighthouse. Guests can enjoy Vietnamese dishes at the restaurant or have a drink at the bar. The rooms at the resort are equipped with a seating area and a flat-screen TV. The private bathroom is equipped with a shower. Guest rooms at Lotus Vung Tau Resort have air conditioning and a desk. The accommodation has an outdoor pool. 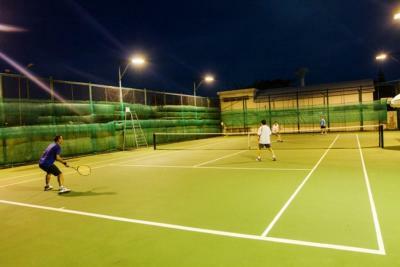 You can play tennis at this 3-star resort. 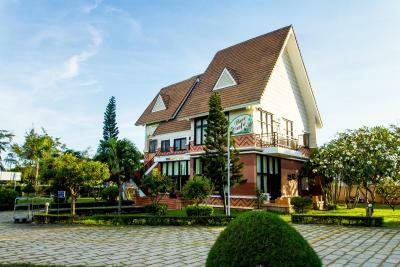 Ho May Culture and Ecotourism Park is 5 miles from Lotus Vung Tau Resort. The nearest airport is Tan Son Nhat International Airport, 66 miles from the resort. When would you like to stay at Lotus Vung Tau Resort? This double room has air conditioning, mini-bar and dining area. This twin room features a dining area, air conditioning and mini-bar. This triple room has a flat-screen TV, dining area and mini-bar. Lotus Vung Tau Resort is located in the center of Thuy Van Beach, Vung Tau City with beautiful beaches, clean, travel is an ideal place for travelers to the foot here. 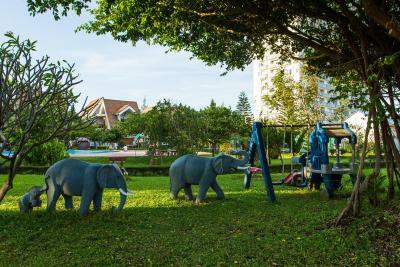 With conveniently located, Lotus Vung Tau Resort stretches the coast in beautiful green landscape, dreaming, attracting many tourists travel, leisure and work. With the design in the classic style, the villa consists of nine buildings are designed in a village house motif Highlands, with wide spaces overlooking the beautiful gardens, which are mixed in plus and green colors more flowers adorn the mansion more majestic and magnificent. House Rules Lotus Vung Tau Resort takes special requests – add in the next step! Lotus Vung Tau Resort accepts these cards and reserves the right to temporarily hold an amount prior to arrival. For reservation made from 18 March 2019, room rates on 13 April 2019, 27 April 2019 and 29 April 2019 include a compulsory BBQ. Extra guests will be charged separately at the property. There were some mosquitoes in my room. There should be more choices for breakfast . The staff was friendly. The location is good. Room is large but quite old, our bed smells damp. Good location & okay swimming pool. The pool was empty as they were retiling it, they did give us a voucher for the pool across the road but only when we complained. Buffet style breakfast with lots of Vietnamese options not much western. The tea and coffee pot only had one cup left in each and was not refilled. This hotel is run down, the rooms are dated and knocked about. They are noisy and you hear everything happening next door. This is a one star hotel NOT thr three star they claim. You have to endure lots of people smoking around you at breakfast, very disgusting and why thr hotel allows it is beyond me. To top it off they had a private function on in their restaurant in the night. You are never told it will be unavailable by the hotel. Then you see a pa sound system big enough to fill an arena set up and we then hours of the most distorted out of key, off pitch extremely loud, singer must have had the microphone down their throat horrible singing that went on and on. So loud in our room that we could not hear each other talk or the tv. We where. It close to the restaurant but it was still this loud. We were never told by the hotel staff it would be on. Totally wrecked our night and stay there. The beds are cheap, lumpy and rock hard to top it off. Don't waste or spoil your trip to Vung Tau by staying here. We are very disappointed and angry. No apology by the hotel, they don't give a rat's was the vibe. Terrible place. Room was $40 but air conditioner doesn't work and even there was a blackout. I asked staff to change room twice time, but he didn't answer anything and brought fan to my room. It made me mad. Because of this hotel, memories in Vung tau was terrible. Person who read this review, please do not go there.